SANTA FE, N.M. (AP) — New Mexico, the state with the largest percentage of Hispanic residents in the nation, could be the latest to adopt sanctuary status regarding immigrants, under a Democratic plan. In addition, state agencies couldn’t use public funds to help federal authorities in “detecting, apprehending, arresting, detaining or prolonging the detention of a person” facing possible deportation. 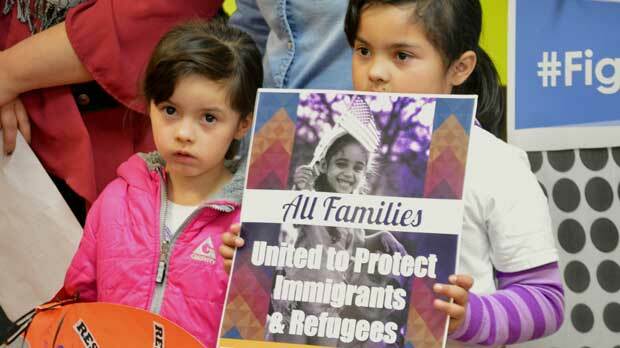 Emmanuelle “Neza” Leal-Sanchez, a spokesman for the Santa Fe-based immigrant advocacy group Somos Un Pueblo Unido, said activists believed it was time for the state to join the national movement. “These are policies that have been proven to make communities safer,” Leal-Sanchez said. Immigrants would be more likely to report crimes if they know that local law enforcement won’t enforce federal immigration laws, Leal-Sanchez said. Republican Rep. Alonzo Baldonado of Los Lunas said he didn’t know if that was true and such a law would make New Mexico less safe. “Our law enforcement agencies need to be able to interact with other agencies, including federal ones,” Baldonado said. Roybal Caballero said Democrats feel strapped law enforcement agencies shouldn’t be involved in immigration enforcement. “The governor certainly believes law enforcement resources should be put toward measures that will enhance public safety in our communities, not the sort of punitive and often arbitrary immigration tack of the current federal government,” Stelnicki said.